This chair sits proud as a peacock! 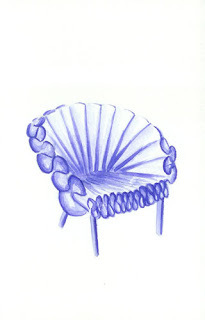 New York based designer Dror Benshetrit has created the Peacock chair for Cappellini. It's created out of three sheets of felt and a minimal metal frame. The folds of the felt are woven tightly to form a structured yet incredibly comfortable lounge chair, with no weaving, sewing, or upholstery involved.